But I'm moving there anyway. Ha. This will be interesting. And you can see the cathedral basilica from my window. A month into the season, can the stats really look like this? All five AL Central teams in the top half of baseball? Two in the top five? And what's that? 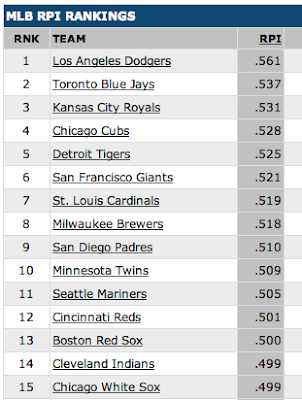 Is that the Royals leading the division, garnering spot #3? This must be a misprint, a mistake, a misunderstanding. At least, it's May. And that's kind of exciting. Maybe, just maybe, they can keep this up.